Model T Ford Forum: Correcting fasteners: What goes here? Correcting fasteners: What goes here? 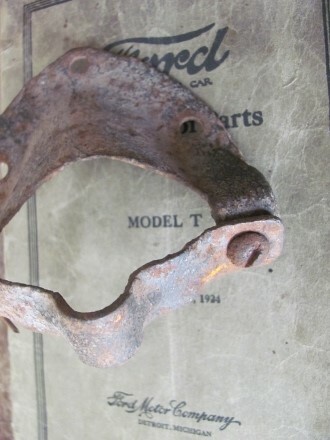 Model T Ford Forum: Forum 2014: Correcting fasteners: What goes here? I'm still going through the 1923 touring replacing bogus hardware with stuff that at least looks more correct. Anybody have a picture of what holds the steering column support clamp? 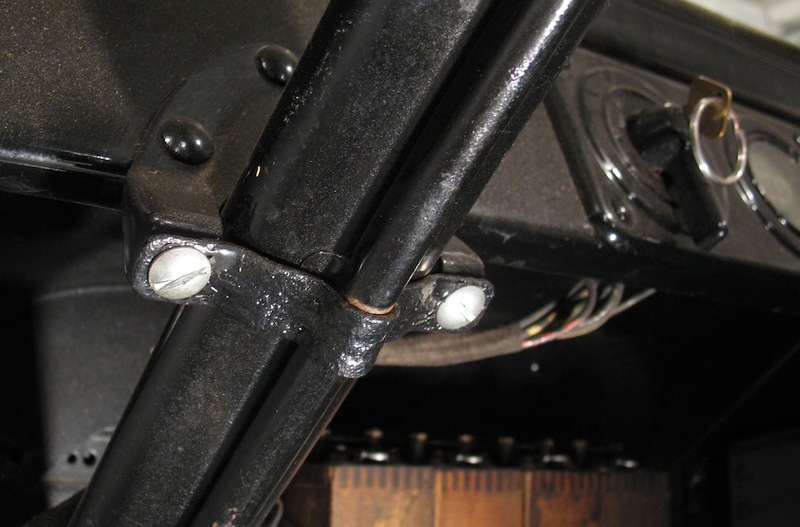 My 1924 cut-off touring (now a pickup) has hex bolts there, painted black, but I don't know if they're correct either. Small round head machine screws with lockwasher and square nut on the backside. I agree with Dan . The square nut is essential as it sits in the back neatly and does not turn as you tighten the machine screws. Dan and John are correct, and the bolts need to be "round" head like the original one he is showing, and not "pancake" head as you have now. and using the square nut saves having to use a wrench on it . I just took mine apart...round head machine screws with a square nut on the back. 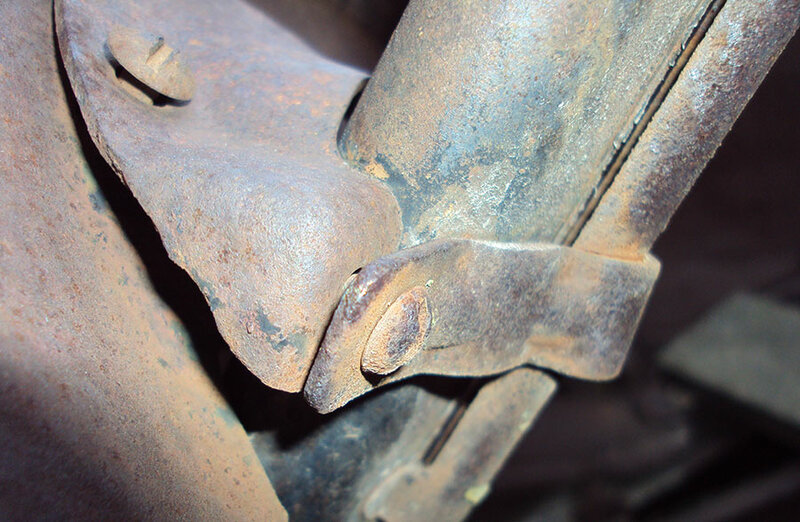 The square nut "nests" in the corner of the large steering support bracket. I would have agreed about the rounder head screw except I just looked at an untouched '24 Tudor which has slightly flatter screws. Closed cars had the bracket screwed on rather than riveted which I believe the open cars had. It is possible that the screw head varied from time to time. I have an original support bracket in my hand, and it is in mint condition. It has two small reinforcing ribs on each side. They do use a round head slotted 1/4-20 screw, and a totally flat square nut, not chamfered. I'll be happy to post a picture, but hate doing it. A follow-up: To add insult to injury, my incorrect hex bolts turned out to be metric! They have been replaced with the proper 1/4-20 round head slotted screws, lock washers, and square nuts. 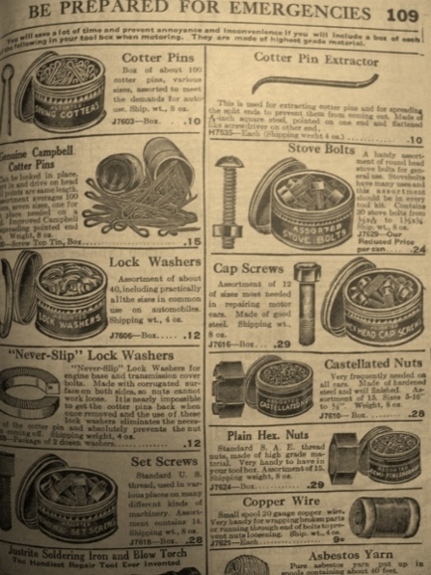 Do not quote me on this, but I believe I have seen the round head bolts (machine screws) referred to as "high crown" or "low crown" in old catalogs. Then the ones made today, like Steve has shown above are "pancake head" The high and low crowns are the same diameter heads with different "crowns" and the pancake has a larger head. I also think "bolts" have threads part way, and "machine screws" are threaded all the way. but all of this may just be ramblings of an old geezer. If you want the monikers from 1923, then the cap screws and stove bolts are what are called for on the T.
Dan, I always thought "stove bolts" were "tapered" (V shaped)and fit flush when installed. Its funny how different terms are used in different areas and have changed thru the years. Steve, it appears you have the correct bracket for you steering support. I would sandblast it, and it will probably come out ok. There is also a u gasket that goes over the UPPER bracket that is riveted to the dashboard. We make those, and they are available from Langs. Stove bolts were round head slotted machine screws in the day. Donnie I think what your refering to are plow bolts. After my father in law passed, I inherited a whole case of "stove bolts" in a wooden chest. the drawers were marked "Stove bolts" in the best Southern Pacific RR lettering. Square nuts too. I guess the old fella liberated them during his 50+ years of service with the road. Now who'd argue with the rail road? These are the tall head screws which are used in several places on my 16 like the wind shield hinges. This may not answer your question Steve but it is one more point of reference FWIW.